TOMS-EP (Total Ozone Mapping Spectrometer - Earth Probe) is contributing to NASA's long-term daily monitoring of the global distribution of the Earth's ozone layer. TOMS was selected in 1989 as a small Explorer (SMEX) under the Explorer program, but received no funding. Transfererd to NASA's Earth Probe program, it was finally funded and renamed TOMS-EP. 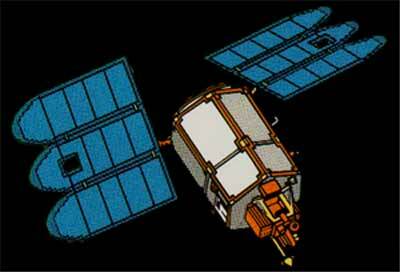 The satellite was built by TRW for NASA's Goddard Space Flight Center (GSFC). The T100 bus was utilized. The single instrument was the TOMS-3 (Total Ozone Mapping Spectrometer 3). The spacecraft was three-axis stabilized so that the TOMS instrument was nadir-pointed with about 0.5° control and about 0.1° knowledge from measured altitude data. The TOMS-EP spacecraft bus was designed to accomodate all of the TOMS instrument requirements to support a two-year lifetime with a three-year lifetime goal. Launch failures of the first two Pegasus-XL vehicles have caused a 2 year delay in the launch of TOMS-EP. These delays have caused the mission to be altered. TOMS-EP has been placed into a lower orbit than originally planned in a effort to achieve higher resolution measurements and to study UV-absorbing aerosols in the troposphere more thoroughly. The lower orbit therefore complements measurements taken from the ADEOS TOMS instrument.